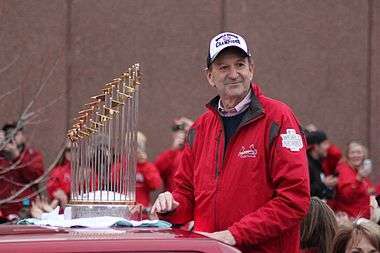 William O. DeWitt, Jr. (born August 31, 1941) is an American businessman and currently the managing partner and chairman of the St. Louis Cardinals, a professional baseball franchise which competes in Major League Baseball (MLB). The Cardinals have won two World Series – in 2006 and 2011 – during DeWitt's time as owner. In addition to the Cardinals, DeWitt has also owned or invested in the Cincinnati Stingers hockey club, Baltimore Orioles, the Cincinnati Reds and the Texas Rangers. Business interests outside of baseball include Reynolds, DeWitt & Co., which owns Arby's franchises and invests in U.S. Playing Card Company, and the petroleum company Spectrum 7. DeWitt, the son of longtime Major League Baseball executive Bill DeWitt, and Margaret H. DeWitt, was born in St. Louis, Missouri where he attended St. Louis Country Day School. He was around baseball constantly as a child, inasmuch as his father owned the St. Louis Browns and Cincinnati Reds, and DeWitt served as a Browns batboy. He earned a bachelor's degree from Yale University in economics 1963 and an M.B.A. from Harvard University in 1965. Dewitt joined Cincinnati investment firm Gradison & Co. in 1974. In 1979, along with Mercer Reynolds, he founded the investment firm Reynolds, DeWitt & Co. The firm owns 63 Arby's franchises estimated at $50.4 million and is an investor in Cincinnati based U.S. Playing Card Company, with an estimated value of about $120 million. It also holds a $40 million stake in Newport Aquarium in Newport, Kentucky. Another firm of DeWitt's involvement with private equity is in DeWitt Capital Group, registered since 2012. DeWitt was an investor in the Cincinnati Reds and one-time part-owner of the Baltimore Orioles. In 1984, one of DeWitt's business ventures, the oil company Spectrum 7, bought George W. Bush's Arbusto Energy, and in turn merged with Harken Energy in 1986. When Eddie Chiles intended to sell the Texas Rangers baseball franchise in 1989, DeWitt teamed with Bush and brought a group of investors together to help purchase the Rangers. DeWitt has also held shares in the National Football League's Cincinnati Bengals and the former Cincinnati Stingers of the World Hockey Association. 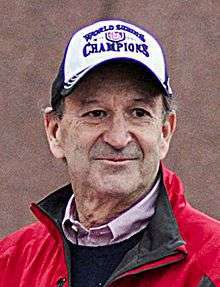 In 1995, DeWitt, with Stephen and Frederick Brauer, purchased the St. Louis Cardinals from Anheuser-Busch for $150 million. He oversees all league, financial, operational and baseball affairs for the club. Since DeWitt bought the team, the Cardinals have won two World Series (2006 and 2011), four National League pennants, and eight division titles, and have made 11 total playoff appearances. According to Forbes, as of early 2013, the Cardinals are worth $716 million. The Cardinals are one of the largest privately held firms in St. Louis, bringing in an estimated $233 million in revenue in 2012. DeWitt during the 2011 World Series Parade. In 1997, DeWitt established Cardinals Care, a nonprofit organization that builds baseball fields, assists youth baseball programs and awards grants to children's boards. Over the life of the organization, Cardinals Care has distributed over $18 million. The organization has built 18 baseball fields in the Greater St. Louis area. Redbird Rookies, a network of leagues Cardinals Care operates, was formed in 2004 and allows children to play baseball who would not otherwise have the opportunity. It also provides equipment and other necessities. Further, the program provides training for coaches and organizers to learn coaching and character-building elements integral to the program. Parents also have the opportunity to participate in workshops that teach the leagues' outlook. Redbird Rookies operates 20 leagues and serves nearly 4,500 children around Greater St. Louis and in rural sections of Missouri and Illinois. The Cardinals have purchased three of their minor league affiliates since the DeWitt group took over. In 1998, DeWitt purchased the Palm Beach Cardinals of the Florida State League (minor league A-ball) and, in 2005, the Springfield Cardinals of the Texas League (AA). As of April 2013, the team negotiated to purchase the Memphis Redbirds of the Pacific Coast League (AAA) from the Memphis Redbirds Foundation (MRF), a local non-profit entity. However, talks went on hold due to defaulted bonds on the building of AutoZone Park. On November 16, 2013, the Cardinals announced a resolution to purchase of the team while the city purchased the stadium. The Cardinals agreed to lease the stadium from the city while Memphis will upgrade the park. In 2013, Forbes listed the Redbirds as one of the ten most valuable minor league franchises. To expand the Cardinals' international presence, DeWitt opened baseball academies in the Dominican Republic and placed representatives in six foreign countries. The Cardinals moved from their old home, Busch Memorial Stadium, to Busch Stadium in 2006. The new stadium cost $365 million and is one of the few majority privately funded MLB stadiums, along with the San Francisco Giants' AT&T Park and the Los Angeles Dodgers' Dodger Stadium. Busch Stadium cost $45 million (12%) in a long-term loan from St. Louis County, while, by comparison the Milwaukee Brewers' Miller Park ended up drawing 77.5% in public funding. In conjunction with opening the new Busch Stadium, a mixed-use retail, entertainment, hotel, residential and office space known as Ballpark Village was planned for development adjacent to Busch Stadium. However, several years of delays postponed the groundbreaking and construction until spring of 2013. In 2009, the Cardinals hosted the All-Star Game. DeWitt began emphasizing developing talent as much as possible through the minor leagues, rather than relying mainly on free agents. Seventeen of the 25 players on the Cardinals' 2011 World Series roster were Cardinals' draftees. In January 2014, the city of Memphis cleared the Cardinals to purchase the Memphis Redbirds from the MRF. Ballpark Village construction was completed and it opened in March 2014. The Cardinals also announced the rechristening of the team Hall of Fame Museum with an annual selection process selection commencing in 2015. Twenty-two former Cardinals players and personnel were announced for induction into the Hall of Fame for the inaugural class of 2014. Closed since 2008 when the International Bowling Hall of Fame moved to Texas, this reincarnation of the museum is located in the newly constructed Ballpark Village within the same building as the Cardinal Nation Restaurant. The Cardinals' value exceeded $1 billion for the first time in 2015 when Forbes appraised the Cardinals outright at $1.4 billion, making them the 27th-most valuable sports franchise in the world, and sixth-principal franchise in Major League Baseball (MLB). It was an increase from an $800 million pricing and eighth in the echelon in 2014. Their revenue was $294 million while their operating income was $73.6 million, and their overall assessment was approximately $200 million higher than the MLB average of $1.2 billion. Mike Ozanian of Forbes remarked that the Cardinals were "baseball's biggest anamoly", with outsize value outpacing their status as one of baseball's "smallest markets", and Ballpark Village was a popular destination for dining and entertainment. The Cardinals' local television ratings (7.76) graded the highest among all major league teams. Reports surfaced on June 16, 2015, that the Federal Bureau of Investigation (FBI) were reviewing an alleged incident involving Cardinals' front office officials hacking into the Houston Astros' database of players, scouting reports and proprietary statistics. It was regarded as the first known case of corporate espionage involving computer network hacking in professional sports. On September 19, 2015, the Cardinals became the first team in MLB to clinch a playoff spot that season. It also extended a franchise record of five consecutive seasons of reaching the postseason, a record which the club had set in 2014. In 2003 President George W. Bush appointed DeWitt to be on the President's Intelligence Advisory Board and tapped his wife, Kathy, to serve on the National Endowment for the Arts. DeWitt and his wife, Katharine Cramer DeWitt, live in Indian Hill, Ohio and have four children and twelve grandchildren. Their children are Katie, Bill, Andrew and Margot. Andrew DeWitt is the founder and CEO of Dewey's Pizza. Bill DeWitt III is the President of the Cardinals. ↑ "Bush picks three for inaugural fundraising". Fox News. Associated Press. November 19, 2004. Retrieved August 11, 2009. 1 2 3 4 5 6 "St. Louis Cardinals: Front office-William O. DeWitt, Jr.". www.mlb.com. Retrieved August 12, 2013. ↑ "William O. DeWitt, Jr.". ISB O2O Platinum Profiles. Retrieved August 12, 2013. ↑ "DeWitt Capital Group, LLC". www.bizapedia.com. Retrieved August 12, 2013. 1 2 Wagman, Jake (October 18, 2011). "DeWitt has long, strong ties to Texas Rangers, Bush". St. Louis Post-Dispatch. ↑ Holtzman, Jerome (December 26, 1995). "Baseball's sign of the times: Under new ownership". Chicago Tribune. ↑ "St. Louis Cardinals team history & encyclopedia". Baseball-Reference.com. Retrieved November 3, 2013. ↑ DeLevigne, Lawrence (October 23, 2013). "The big money behind the Cardinals, Red Sox". CNBC. Retrieved November 3, 2013. ↑ Liss, Samantha (June 7, 2013). "Check out updated photos of Ballpark Village". website=St. Louis Business Journal. ↑ "About Cardinals Care". Cardinals Care. Retrieved November 3, 2013. ↑ "Community: Youth baseball fields". www.stlouis.cardinals.mlb.com. Retrieved November 3, 2013. ↑ "Cardinals in the community: Redbird Rookies". www.stlouis.cardlinals.mlb.com. Retrieved November 3, 2013. ↑ Walton, Brian (July 17, 2013). "Forbes: Memphis Redbirds is eighth-most valuable franchise". The Cardinal Nation Blog. ↑ Liss, Samantha (November 16, 2013). "Cardinals acquire Memphis Redbirds". St. Louis Business Journal. Retrieved November 16, 2013. ↑ Smith, Chris (July 17, 2013). "Minor League Baseball's Most Valuable teams 2013". Forbes. Retrieved November 16, 2013. ↑ Goold, Derrick (September 2, 2012). "Cards on the move in the Dominican". St. Louis Post-Dispatch. ↑ Adams, Bruce; Engel, Margaret (April 30, 2006). "St. Louis ballpark: Lucky Cards". The Washington Post. ↑ Jannenne, Jeramy (May 28, 2009). "Miller Park vs Busch Stadium". www.urbanmilwaukee.com. ↑ Logan, Tim (January 31, 2013). "Cardinals to Break Ground on Ballpark Village Next Week". St. Louis Post-Dispatch. Retrieved February 1, 2013. ↑ Goold, Derrick (January 8, 2014). "Cards cleared to buy affiliate in Memphis". St. Louis Post-Dispatch. Retrieved March 3, 2014. ↑ "Busch Stadium Ballpark Village information". stlouis.cardinals.mlb.com. Retrieved September 19, 2015. ↑ Langosch, Jenifer (September 19, 2015). "Cards become 1st team to clinch postseason spot". stlouis.cardinals.mlb.com. Retrieved September 19, 2015. ↑ Weiser, Carl (October 10, 2003). "Bush taps DeWitt for inner circle". Cincinnati Enquirer. ↑ "Senate confirms appointments of Don V. Cogman, Katharine DeWitt, Maribeth Walton McGinley and Teresa Lozano Long to the National Council on the Arts". ArtScope.net. Retrieved August 12, 2013. ↑ Walker, (not given) (March 4, 2009). "Everything you need to know about Dewey's Pizza". www.columbusunderground.com. ↑ "St. Louis Cardinals: Front office-William DeWitt III". www.mlb.com. Retrieved August 7, 2013.